Lollipop Opera brings the excitement of live theater to children. Each show is fully staged, with beautiful sets & costumes. 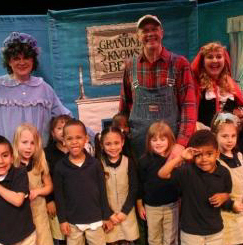 Our goal is to expand the horizons of children through exposure to the arts. Children will learn how opera is a true marriage of the arts, incorporating music, acting, & visual arts. The opera talk gives kids a basic understanding of opera and its history, teaching by example, & by comparisons to everyday activities and experiences with which they easily identify. General Director and performer Deanna Swanson is a graduate of Hartt School of Music with a BM in Opera Performance. A former member of CT Opera's Opera Express, Deanna has been bringing the joy of opera to schoolchildren for over 10 years.